To get detailed stats (specific for an author), you can use the parameter author, feeding it with the user ID of which stats should be shown. For example, [ppc author=1] will show detailed stats for user ID 1. You can also use [ppc author="current"] to make the user selection dynamic: in this case, the stats for the user who opens the page will be shown. Finally, you may want to exclude some cols from displaying, as public themes are often less wide than the admin template. For this, it is enough to list them in the parameter exclude; you can separate them with a comma. [ppc author=1 exclude="post_id, post_publication_date"] will show stats for user ID 1 excluding post id and publication date from the display table. You can mix them however you prefer. while for detailed stats are: post_id, post_title, post_type, post_status, post_publication_date, post_words, post_visits, post_adsense_revenues, post_images, post_comments, post_bonus, post_facebook_shares, post_facebook_comments, post_total_payment, post_due_payment. display_overall=1 – To display overall stats at the bottom of the stats table (this will display total counts and payments per counting type, number of written posts and total due payment). display_timerange=0 – To hide the current time range information. display_timerange_choices=0 – To hide the choices of different timeranges. time_range=”last_month” – Provides a dynamic shortcut to last month stats. Will display stats from the previous month. time_range=”last_week” – Provides a dynamic shortcut to last week stats. Will display stats from the previous week. time_range=”current_month” – Provides a dynamic shortcut to current month stats. Will display stats from the current month. As a side note, bear in mind that marking posts as paid and full payment history features are not available in shortcoded stats, as they are advanced and dynamic features which rely on the admin section. 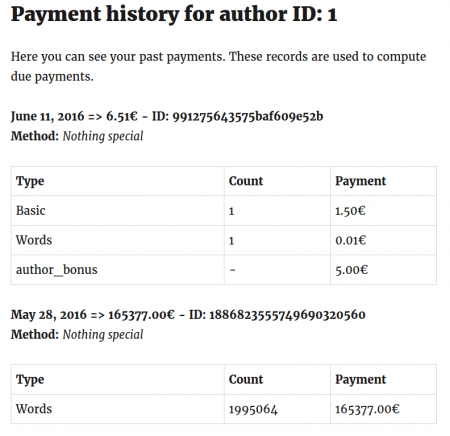 To display the current author payment history, there is another shortcode, which is [ppc_author_payment_history]. There is also a shortcode to allow users to enter the PayPal email address they would like to be paid to, which is [ppc_user_paypal_email_settings]. Other ways in which authors can enter their PayPal address are detailed in this tutorial. I have a query regarding these shortcode. Do shortcode have ability to display Payment per post on single blog post ? I want to add payment received for current post by the Author in there meta description box after post. I want to remove the Bonus Column and Words, can you please help me with the shortcode. This will exclude the columns for Author Id=1, what if I want to exclude the Word Count and Bonus Column for all the authors. Is there a way out. Yes sure, but it depends if you need the genera stats or the author detailed ones. 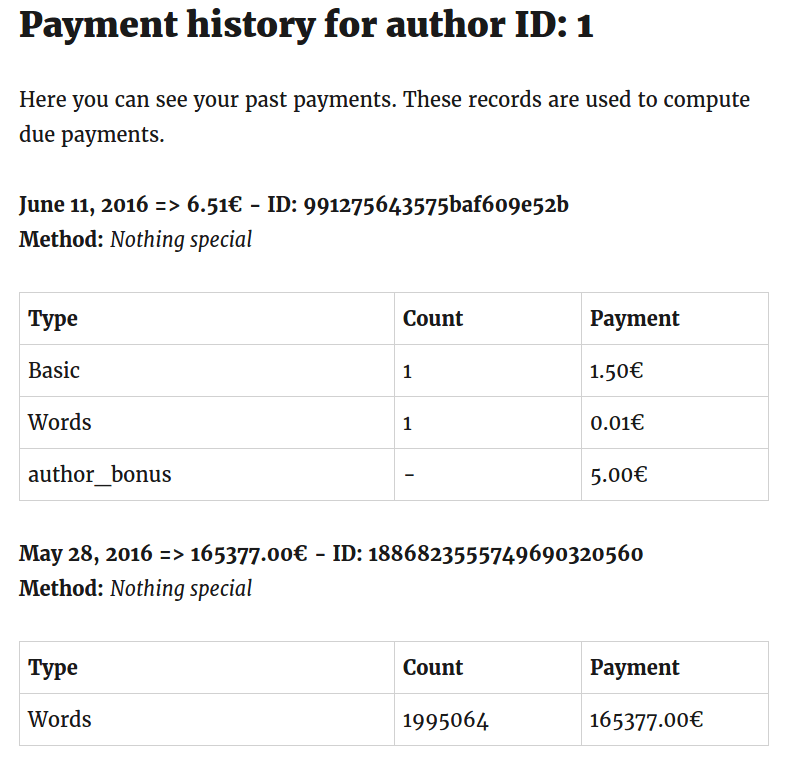 [ppc exclude="author_words_count, author_payment_bonus"] works for excluding words but doesn’t work for bonus. It will be great if bonus can be excluded as well. Can you allow only the user that is logged in to see their own stats? 1. Stats title into “All Time Stats” when set to all time instead of date range? Because it shows from 1970 at the beginning. 1. Sorry, but can’t understand what you mean. Is it related to the shortcode feature or not? Could you explain it again please? Thanks! 1. 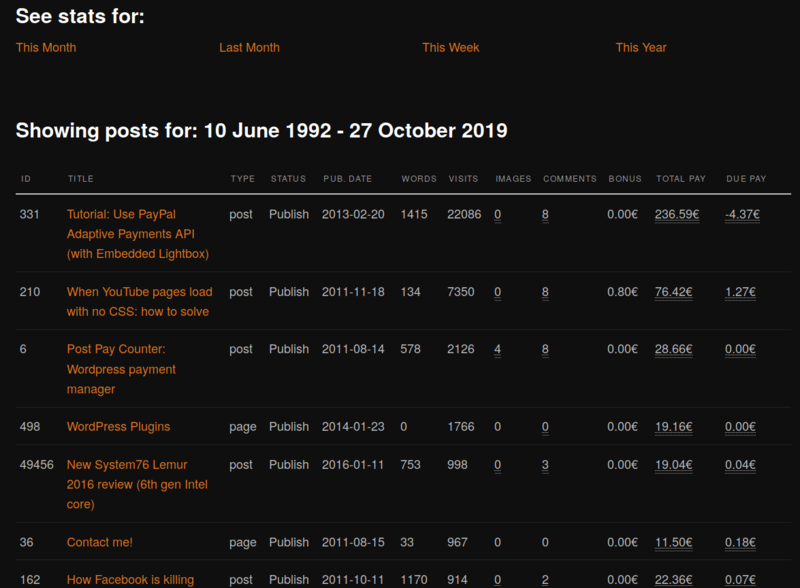 I set on Post Pay Counter->options->Miscellenia-> Default stats time range as “All Time” and put this shortcode: [ppc author="current" exclude="post_id, post_type, post_status, post_publication_date, post_total_payment, post_bonus" display_overall=0] on a page called “My Incentive” where a user can see their own stat. Stats table has this title: 01/01/1970 – 02/03/2017 (Time range). I think it’s better to have “All Time” as title instead of the time range. its possible to sort the table? The best autor on the top by the final revenue? Thank you. i was buy the PRO for this feature mostly :/ . Please very much, put this functionality in next update. Thank you very very much in advice. Adding one point here, use keyword “post_facebook_shares” to exclude facebook shares in detailed stats. Hi there, we’re using Post Pay Counter Pro and we need the [ppc] shortcode to display ALL posts by the user, but allow us to filter the views by timeframe/range. So we want to see how many views ALL an author’s posts got last month, or this month, or the whole year. Not only posts that they’ve written during that time frame. Is this possible?